At last we have seen something of the sun although the east wind is still keeping temperatures down. However it's a good chance to sit inside in the warm and sew! April's meeting is fast approaching, as is Kim's workshop. Well known for her experimental techniques especially the use of heat to transform textiles, it looks like a really fun day. Don't be put off by the long list of requirements as Kim can provide many of the items and perhaps we can help each other out (as we normally do!). Have a look at the current 'Stitch' magazine - April /May for a taster of the day. Final payment is due on Monday. 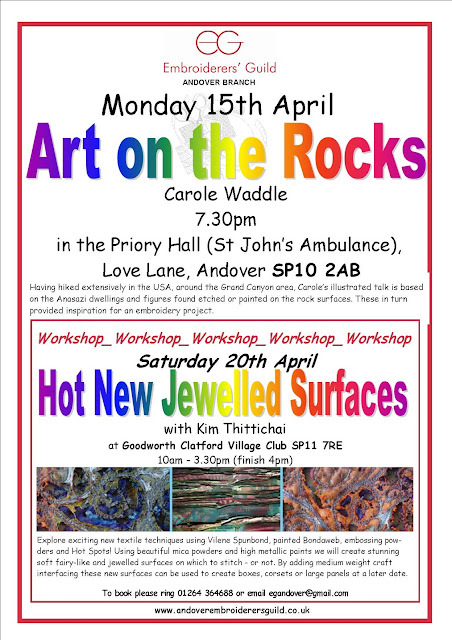 Guild member, Carole Waddle, our speaker on Monday, has travelled throughout the U.S.A. and will show how the grandeur and colour of its canyons and the cave dwellings, rock art and artefacts of the prehistoric people have inspired her work. Hope you can make it.